Attention to all mommy lover and gift givers! You are going to be serenaded by these loving and cutie personalized mommy notepads. These notepads have been an uproarious hit during the Mother’s Day and you are definitely bound to get flowered with the thought of giving away these hilarious notepads to loving mothers. 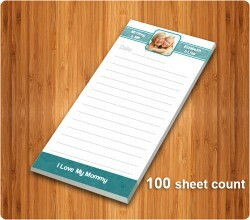 We can help you out with the caricatures or cartoons to customize these loving notepads. Customized mommy notepads also make a great gift choice during birthdays, Teachers appreciation events, and at other times when you are doodling with ideas of surprising your sweet mommy. Your notepads will definitely evoke a smile on the face of any mom who will receive it!